Real Madrid defender Sergio Ramos has denied getting booked on purpose late on in Wednesday’s Champions League last-16 first-leg at Ajax. 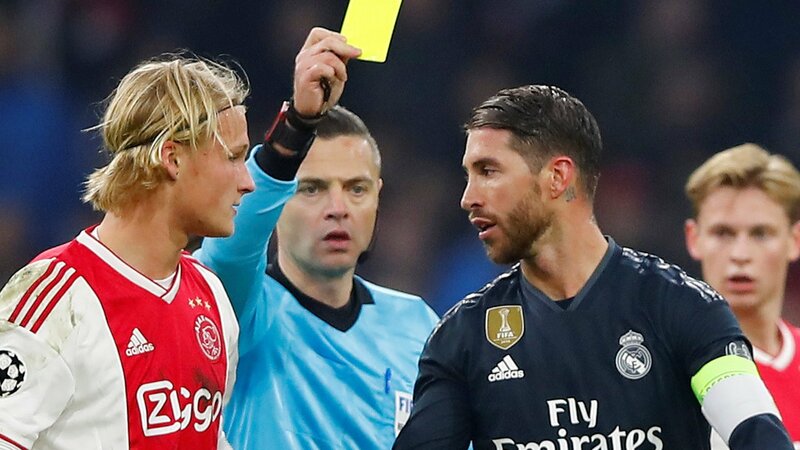 Ramos fouled Kasper Dolberg in the 89th minute with Real leading 2-1, earning a suspension for the second leg. Television commentators intimated he sought the booking but Uefa rules state a player who purposely obtains a booking can be banned for two games. Afterwards, Ramos, 32, tweeted: “I have not forced the card”. The Spain international was making his 600th appearance for Los Blancos and his side secured a first leg advantage through Marco Asensio’s goal two minutes before the controversial booking. Pundit Martin Keown said it was “very obvious” Ramos was looking to pick up a third booking in the competition to be banned for the second leg – a suspension at this stage greatly reduces the risk of missing a match later in the competition with all bookings wiped following the quarter-final stage. Following the win, Ramos told reporters he would “be lying if I said I didn’t force [the booking]”. But later on social media he said the view he intentionally played for the yellow card “hurts”, insisting “I have not forced the card”. Ramos’ team-mate Dani Carvajal received a two-game ban from Uefa when he was judged to have been booked on purpose in the final minute of a 6-0 win over Apoel Nicosia in last season’s tournament. Both players were also criticised in 2010, when they were booked and sent off in the final five minutes of a group game with Ajax, meaning they missed the next fixture, with Real already assured of progress to the knockout stage.